Stratigraficheskaya shema chetvertichnyh otlozheniy Ukrainy (Stratigraphical framework of the Quaternary deposits of Ukraine), 1993. / Veklitch M.F. (Ed.). – Kiev, Goskomitet geologii Ukrainy. – 41 p., 8 tables. Gozhik P., Matviishina Zh., Gerasimenko N., Rekovets L., Shelkoplyas V., 2001. 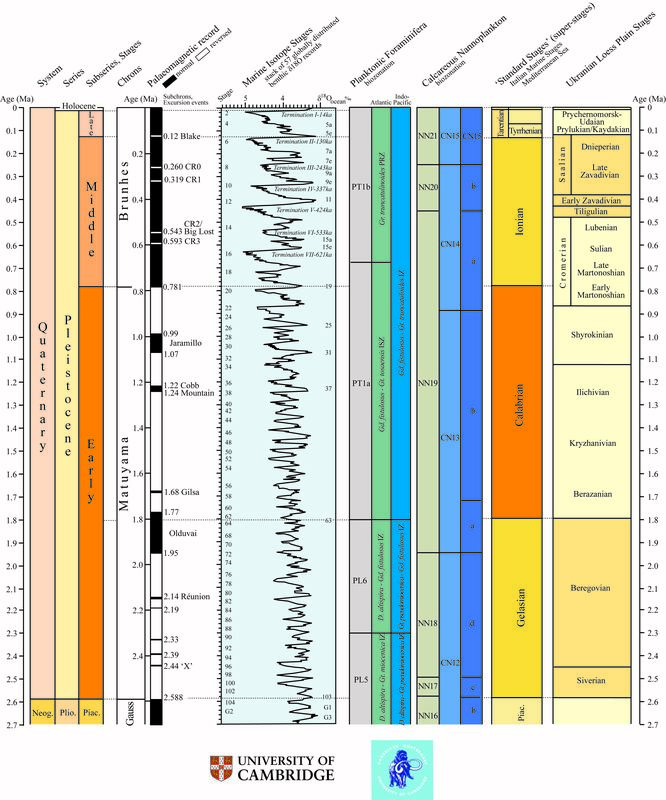 The Quaternary stratigraphy. In: The Ukraine Quaternary explored: the Middle and Upper Pleistocene of the Middle Dnieper area and its importance for the East-West European correlation. – Kyiv, Institute of Geological Sciences of National Acad. of Sci. of Ukraine. – Р.8-11. Lindner L., Bogutsky A., Gozhik P., Marciniak B., Marks L., Lanczont M., Wojtanowicz J. 2002. Correlation of main climatic glacial-interglacial and loess-palaeosol cycles in the Pleistocene of Poland and Ukraine Acta Geologica Polonica. Vol.52, No.4. P.459-469. Matviishina Zh.M., Gerasimenko N.P., Perederiy V.I., Ivchenko A.S., Nagirnyi V.M., Karmazinenko S.P., 2010. Prostorovo-chasova korelyatsia paleogeografichnyh podiy chetvertynnogo periodu na territorii Ukrainy (Spacial-temporal correlation of palaeogeographical events in the area of Ukraine during the Quaternary) / Gozhik P.F., Palienko V.P. (Eds.). – Kyiv, Naukova dumka. – 191 p.
Gozhik P.F., Gerasimenko N.P., 2011. The Lower and Middle Pleistocene of Ukraine // The Quaternary studies in Ukraine. – Kyiv, Institute of Geological Sciences of National Acad. of Sci. of Ukraine. – P.9-26.